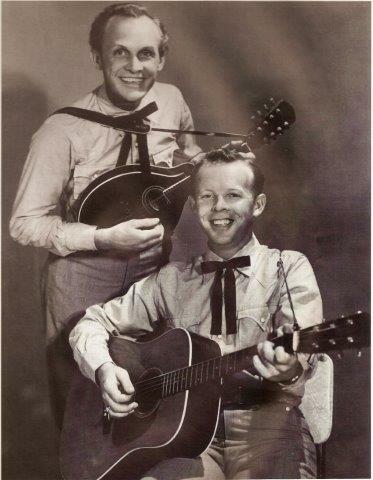 The Louvin Brothers : Ira at left, Charlie at right. 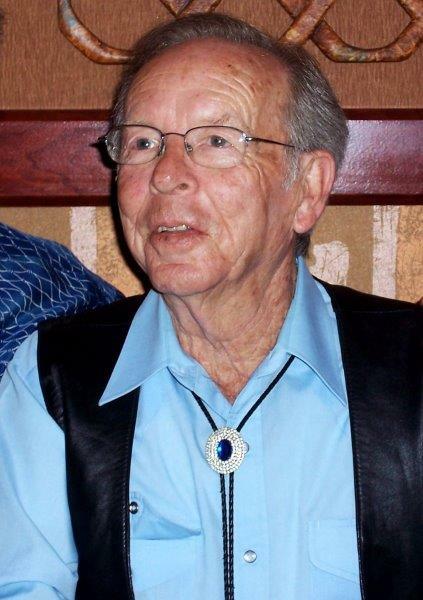 As the long surviving member of one of country music’s most celebrated and influential brother duets, Charlie Louvin lived to see the awards and tributes and he continued to perform and thrill audiences. 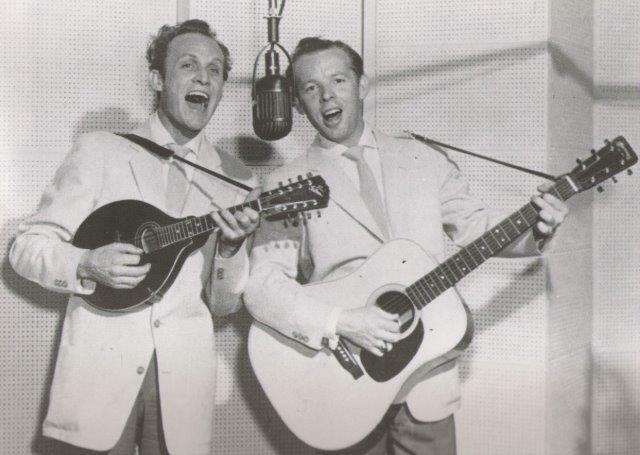 The music of the Louvin Brothers, Charlie and Ira, is still cherished and sought after. I interviewed him in April 2005 in Green Bay, Wisconsin, before his performance at Rockin’ Fest II. Most of my questions have been edited out. The official Charlie Louvin site is here. Charlie Louvin : I was born July 7, 1927, in northeast Alabama, the tail end or the trail’s end of the Appalachians. It was very poor country. We was poor people. We farmed. In the early days our basic cash crop was cotton. Later my father bought a sorghum mill and we raised some sorghum cane [a plant introduced into the U.S. in the early 17th century by African slaves], which was more profitable than cotton. Then after a few years, he started making the sorghum for other people. He grew the cane and you’d get a toll on that. We ended up with lots of sorghum, and it was hard to sell, but I think a half-gallon bucket, four and a half pounds, sold for 30 cents a bucket. Today, that same sorghum is selling for $10. They don’t even make the buckets anymore, so you have to get it in a glass jar. We’d grow a lot of watermelons—the sandy loam soil of northeast Alabama was very good for sorghum cane and watermelons. My daddy had a small farm, just 40 acres : 23 acres in cultivation, and the other was pasture and woods. He rented land from the people close by and grew as much as 20 acres of watermelon. People would come from a way off with tractor-trailers at watermelon-picking time, and we had a good team of mules and a good wagon. We’d drive in the field and pick the watermelons and come up to harder ground and put ’em in the trailer, until we got the trailer loaded. Then the men would go weigh ’em and they just bought ’em by the pound. It was a lucrative living, nothing to get rich on, but at least you could afford two pairs of shoes and maybe two pairs of overalls instead of the way it was when we was just young. My mother was a Sacred Harp singer. That’s very prevalent in Alabama, Georgia, and Tennessee. My mother’s mother was a Haynes, her last name was Haynes ; her father’s name was Wootten. There is a reunion held each year on the first fifth after the fourth. That’s confusing to some people but we understand it as the first fifth Sunday after the 4th of July. This year it happens in July, on the 31st of July—the fifth Sunday. They have no instruments. It’s strictly old-timey a cappella singing. There’s one of the gentlemen there, that whatever [key] the song is written in—C being the only natural key on the instruments—if there’s three flats, well, he can run the notes : do fa so la te do. He’d run them up and down, and he’d arrive at which key that song’s supposed to be sung in. Then when he hits that note, everybody would sing the notes [using the shape note version of solfege, known as fasola, from fa-sol-la] to that particular song. After they’d sung the notes through one time, then they’d sing the lyrics. They sing from 8:30 in the morning on that particular Sunday. At about 11 you’d notice the women folks in the church are getting up and excusing theirselves, and at 12 they break. You go outside, and there’s a table about 100-150 foot long, and any conceivable food that you can dream of is on that table. Everybody eats. They talk about who didn’t make it ’til this year, who was here last year but since have passed away. Shake and howdy with new friends, and about one o’clock they put the food away and go back in and sing until about four. Some people come a thousand miles to go to this singing. My brother and I were raised around Sacred Harp singing. People constantly say, "Where did you get your harmonies from ?" ’Cause my brother didn’t sing first tenor. Once in a while he’d do that, but he would branch off into an alto part, and if the song got too high he would take the high lead—he had the higher voice—and I would come under him with low harmony. We did this without stepping on the other one’s toes [to make a signal] like it’s about time, or we didn’t wink or nod, I just knew it was fixing to get too high for me and my brother Ira knew that, so he’d just take it. We could change in the middle of a word. When we started recording for the Capitol record people, we confused the A&R [artist and repertory] man. He’s trying to mix it. He thought that I sang the lead all the way through, which I did not. Part of the time I’m singing harmony, and the lead’s supposed to be stronger than the harmony. So he asked my brother "What is that part you’re singing ?" Of course my brother was touchy about that, and he said, "I don’t have a name for it. Do you don’t like it ?" He said, "Oh I love it, but I just wanted to know what it was." Ira said, "I don’t know what it is. I just thought it would sound good, and I did it." It didn’t change the lead for him to do those weird harmonies. Anyone who knows would tell you that the tenor singer styles the duo. A good tenor singer needs a good strong lead and I believe my brother had one. The tenor in the Osborne Brothers, Bobby Osborne, styles that. You can get Bobby to sing a song with you and it would be more Osborne than anything else. So the tenor is the strong part of any duo. And the baritone I think is the backbone of any trio. You’ve got your lead and your first tenor but your third part balances it out. It makes it very enjoyable to listen to. We dearly loved the Delmore Brothers. They were and still are the hottest duet that ever performed on the Grand Ole Opry. Most people don’t even know that they were on the Opry, but they were on the Opry in the ’30s when radio was all there was. Other devils have creeped into the music business, television being one of them. Today if you’re not on television you’re dead. They assume that you’re dead. But it’s a medium that loves youth and beauty, and very few men have that. When my brother and I started, we auditioned to try to get on the Opry a dozen times. We were very successful at gospel music for the first four years of our career on Capitol. But having #1 gospel songs was not the way to make a living in those days. My brother and I won every award that they ever gave, but they called us a small vocal group. They never referred to us as a duet. We won all the awards but we could not make a living that way, because the gospel singers of that time only had a piano. So they looked at us as a carnival act, using stringed instruments, and they didn’t like us on their shows. The country artists really didn’t like us, because singing the gospel music we quieted the audience and made some of them even feel guilty that they were there ! So the country people really didn’t dig us either. We were ready to quit the business. I had just come back from Korea, and we went to Birmingham, Alabama. There was a duet there called Rebe and Rabe. They sang nothing but Louvin Brothers songs on their radio program. So when Ira and I went to Birmingham, people thought we were impersonating Rebe and Rabe. We were doing our own songs but they had been there so long. We finally got on the Opry in 1955. We got on the Opry through a bluff. I called Ken Nelson—he was our A&R. We’d never asked for his help before. I called him and said "Ira and I want to know if you knew anybody that you might have [who could help] to get us on the Opry. If we can’t get on the Opry we’re going to quit the business, we’re going to get out.” He said, "Well I know Jack Stapp" [the Opry’s general manager] and that was a new name to us. We’d always auditioned for Jim Denny, and he was just a stage manager, that’s all he was. He called him and said, "I’ve got this duet on my label that I’d like to have on the Opry, and they’d like to be there." Evidently Jack Stapp must have stuttered, and Mr. Nelson said, "Well, if you don’t want them on the Opry, the Ozark Jubilee does." The Ozark Jubilee was the first country and music show to get on television, and for some reason, the Opry was afraid of them. Springfield [Missouri], that’s where the Ozark Jubilee came from. He said, "Nah, we don’t want them going to Springfield, there’s enough people up there already. Tell them they’re on, starting this Friday night." That thrilled us to pieces. As soon as we got to the Opry we started hassling our A&R man to do secular music also on record, ’cause in our shows on the road—individual school house shows—we did all kinds of music : folk music, murder music, gospel music. We never gave up our gospel music, but we wanted to mix it. One year or a year and a half before that, Martha Carson’s husband, X. Cosse [Xavier Cosse], wanted Martha to drop her neckline a little, sing a different kind of song, ’cause she was a gospel singer. One of the best gospel female singers that ever lived. She wrote and sang “I’m Satisfied.” Ken told her, "Martha, if the people don’t buy what you replace this with, they’ll definitely quit buying your gospel, and you’ll be off the label." And that’s exactly what happened to Martha. Never to record again. So he had that as his main argument. “Oh, you want to pull a Martha. If the people don’t like what you come [up] with, then you’ll be dropped from the label.” We said, “we want to, we have to take that gamble.” Because the Opry was live on NBC every Saturday night, a 30-minute show, and once maybe every two months you could get on that show, be network. If Ira and I got on it and sang a gospel song then the artist that was presenting the show, the MC, he’d sing one. Prince Albert Tobacco sponsored the show. They said, "Two hymns, two gospel songs is the limit. After all, we’re a tobacco company." So for that reason we also needed to be able to sing secular music. Finally he said, "If that’s what you want to do. I just wanted you to know what it can cost, what could happen." We recorded "When I Stop Dreaming" as our first secular song. It did well. It changed our world. It gave us a chance to raise a family and have something more than just enough for clothes and food. So it was good for us, but we did take a gamble, and it worked. We liked the Delmore Brothers because of their togetherness. I’ve never heard anybody sing together more perfect than the Delmores. We strived for that. And we listened to the Monroe brothers. If you listen to them today they were really a pretty rough duet, but their style was there. And we loved the Blue Sky Boys. Their first big thing that caught our attention was "Why Not Confess," a big number for the Blue Sky Boys. I don’t know why, but I could sit here for five minutes and just name the duets that didn’t stick. Brothers don’t like to take orders from brothers, and I think that that’s the [reason]. Ira and I tried to work it out. I said, “I’ll take care of the business, you take care of the music.” So we’d get on stage and sing two or three songs and he’d look at me and say, "What do you want to sing next ?" I always had a title on the tip of my tongue, and I’d call a title. And he’d say, "What the hell do you want to do that thing for ?" I’d say, "You asked me." But there were problems in his life. Nobody can be sure, but a lot of people say that my brother was called to preach and he refused to do that. So he was, of all people, most miserable. Turned to the bottle. I couldn’t then and can’t today ; I don’t know how to handle a drink. In the old days you were just being mean if you drank. Today they call it a disease. I guess it is a disease, but it’s self-inflicted if it’s a disease. But he had it bad. In fact that’s the only thing that really broke us. We separated on August 18, 1963. He went back home to Alabama and my daddy gave him two acres off the old farm. And [a developer whose name I have edited out] built one of those homes partially, and he finished it. Of course when he got killed he was behind in his payments and before anybody knew it he [the developer] owned the house back and the land it sat on. That’s the way they are. We never got to the hate that some people got, like the Blue Sky Boys. I never met the one that worked at the post office in Greensboro, but I met the one that lived in Atlanta : Bill. I went and talked to him, just to tell him how much I admired the Blue Sky Boys. We talked for 15 or 20 minutes. He was a very congenial man. I said, "How long has it been since you’ve seen your brother, and how’s your brother doing ?" or everhow I said it. He just stood up and said, "I see we’ve run out of anything to talk about. I appreciate your coming by." That ended the conversation. I knew I was fixed to get kicked out, or I could leave on my own. 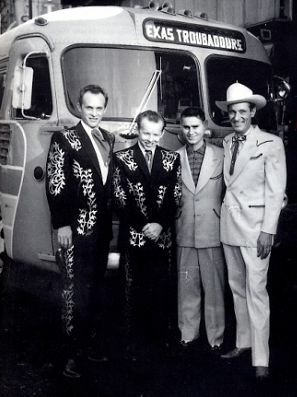 The Louvin Brothers with George Jones and Ernest Tubb. Ira and I never got to the point that we couldn’t stand each other, ’cause we sang together [again] a couple of times. He came back to Nashville to visit one weekend and Ernest Tubb said, "Why don’t you come down and you boys sing a number on the Midnight Jamboree ?" Ira said as an excuse, "I can’t Ernest, ’cause I don’t have no mandolin." He didn’t bring his mandolin with him. Bill Monroe stepped up and said, "You can use mine." He had never—if you asked to see Bill Monroe’s mandolin he would let you look at the front, and then he’d turn it over and you could look at the back, and that’s all ; you couldn’t touch it. But he told Ira that he could use it. Well, we used it. After we finished, Monroe was waiting about three doors down in the cafÃ©, he didn’t come watch. He was a el weirdo hisself, oh yeah. So after it was over Ira put the mandolin in the case and he carried it down to this restaurant where Monroe was waiting. We were sitting there talking, and Monroe informed Ira that "When I die, this is what I want you to sing." Them both being tenor singers, of course, my brother could sing tenor to Bill’s tenor. Bill used a falsetto ; my brother never used one. He had one but he never used it. Ira just kind of laughed and said, "When I die this is what I want you to sing," and he mentioned "Swing Low, Sweet Chariot." Monroe was in the northeast, up in Connecticut or even farther up, maybe as far up as Maine, when Ira’s [car] accident happened on Father’s Day of ’65. He cancelled his tour and came home. He did what he said he’d do. Very few times that he ever done that, but he did. He didn’t bring his mandolin to the funeral home. Marvin Hughes, who recorded a lot of my stuff, he was A&R for Capitol for a while, played the piano. The Jordanaires furnished the vocal background, and he sang that song. He never sounded better in his entire life. Unfortunately there was not a tape recorder no place, so there’s no record of that. Once in a while I play it back in my head. Craig Morrison : What are you most proud of in your life or in your music ? CL : Of course music’s been my life. It’s hard to separate the two, but in my life I was taught as a youngster that your word and your punctuality—if it was no good, then your signature would be worth the same. So I have lived that way. I try to do the old “do unto others as you would like to have them do you.” I try to live by that rule. If I were to write my epitaph if it included something that I tried to be a fair person, but as we grow older we get cynical. I don’t know if life does you that, or you know too much or you don’t know enough or what it is, but my fuse is much shorter than it was in my younger years. When I first became a solo artist, very early I had a release—I think in January of 1964, and we’d just broken up in August. I sold more records than the Louvin Brothers did—like you have a single release, and it lives for about four months. Then you have another one, three a year. But my music didn’t live like the Louvin Brothers music lived. People will ask me today—I classify it as a stupid question, but it might not be stupid—they say, "when you and your brother was recording this music 50 years ago did you think that it would still be viable 50 years later ?" My standard answer is, "Absolutely not. All we tried to do was make a living." We wasn’t thinking 50 years down the road, but it has lived. Every bit of it is available today. The Bear Family [8-CD] set [Close Harmony] was one way, but that’s a very expensive for some people, to drop $200 for a boxed set. International Music Group have everything that the Louvin Brothers recorded on individual CDs and cassettes. Their covers looked exactly like they did when they was released on Capitol. Just the name of the record label changed, that’s all. And they’re selling quite well. The tribute album came out in late ’03, produced by Carl Jackson. It’s called Livin’, Lovin’, Losin’ : Songs of the Louvin Brothers. It was well-thought out, had 33 artists on it, 16 songs. We did a television show December 13 of, I guess it was last year. I got to do the lead vocal [on the television show] with Leslie Satcher on "When I Stop Dreaming.” The album won three awards. Alison Krauss and James Taylor won a Grammy on "How’s the World Treating You ?" The album itself won the compilation album of the year. Three songs made it win the IBMA [International Bluegrass Music Association] award [for Recorded Event of the Year], the strong songs being "I Wish You Knew" bluegrass style, "The Angels Rejoiced Last Night" with Dolly Parton and Sonja Isaac, and "Let Us Travel, Travel On" by Marty Stuart and Del McCoury. My brother and I, you know, we toured with Elvis Presley [in the fall of 1955 and again in early 1956]. Presley opened for us. We went on a 100-day tour with him. Of course he got real big, real quick. But if he were alive today, in 2005, and singing the same songs that he sung in the mid- to late-’50s that they titled him King of Rock and Roll, a lot of stations wouldn’t play them because they’d say he was too country. Country music is still country—it’s just a lot of artists are in it just for the money. You’ve heard the old saying, "The man would sell his grandmother if the price is right." I wouldn’t do that—I don’t have a grandmother to sell !—I wouldn’t record something that I knew didn’t even resemble country, and release it as a country single and ask the disk jockeys to play it, and most likely they would. It’s a fight that we might never win, but country music always makes a comeback. It faded in the late ’50s because of Elvis. The music changed then, I’m not blaming him, but it changed. Then the Beatles came along and that was another kind of dry year and a half for country music. But it always come back. And right now bluegrass music is bigger than it’s ever been. It got to where the radio stations wouldn’t play it. Now some of them are playing it. They’re just a handful, you know I could count them one hand, how many artists that’s been true to their music. I convinced myself a long time ago that I would stick through thick and thin, and it’s gotten thin at time, but it’s been lucrative at other times. I’ve been true to my music, and that’s why the Louvin Brothers are in the [Country Music] Hall of Fame, the Alabama Music Hall of Fame, the Songwriters Hall of Fame, and several other things. It was late coming, it took a long time. We were nominated the fifth time before we got in to the big Hall of Fame. It took some of the joy out of being elected, since Ira couldn’t be here to enjoy that. Colour photo at right : Charlie Louvin, following his performance at Rockin Fest II, April 2005. Photo by Craig Morrison. CM : Thank-you very much. It was a pleasure to speak with you. CL : Well bless your heart. Thank-you, the pleasure was mine and I didn’t mean to do so much talking, but you just mashed my button. You asked the right questions. 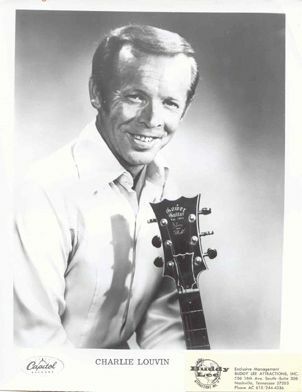 Charlie Louvin died in 2011, age 83. His obituary in the New York Times is here. I have also posted several interviews with members of 1960s psychedelic bands. To go to the index page, click here.